Paris – A study in China’s northwestern Qinling Mountains, home to around 270 pandas and about a fifth of the world’s wild population, predicts a “substantial” bamboo decline this century as the globe warms. “The pandas may face a shortage of food unless they can find alternative food resources,” a team of researchers from the United States and China warn in the journal Nature Climate Change. The international symbol of environmental conservation efforts, the giant panda is a picky eater. Around 99% of its diet consists of bamboo – devouring up to 38kg per day. 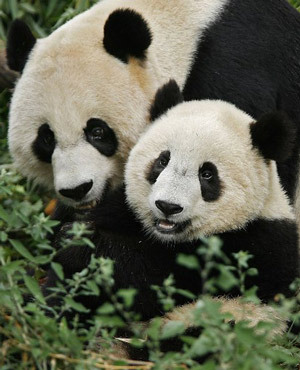 This means the iconic black-and-white bear’s survival is closely linked to a thriving bamboo habitat. Bamboo itself also has a slow reproductive rate, flowering only every 30 to 35 years, which means it would be slow to adapt to a change in local climate, said a statement on the research. Based on the data gathered for this study, researchers predict that three bamboo species which make up almost the entire diet of the Qinling pandas, will all but disappear in a warmer climate. “Results suggest that almost the entire panda habitat in the region may disappear by the end of the 21st century,” said the study report. The calculations are based on different warming scenarios projected by the Intergovernmental Panel on Climate Change, ranging from rises of 2deg C to 5deg C in summer by century’s end, and 3deg C to 8deg C in winter. These projections were collated with data on rainfall and greenhouse gas emissions as well as historical growth patterns, to consider the future of bamboo. Already, deforestation is threatening the survival of about half of all bamboo species worldwide. The researchers say bamboo distribution has historically fluctuated in response to changes in the climate. In the modern era, though, even if other areas were to become climatically more suited for bamboo growth, these would be far away and fall outside the present network of protected panda reserves. The findings should be used “for proactive planning to protect areas that have a better climatic chance of providing adequate food sources or begin creating natural ‘bridges’ to allow pandas an escape hatch from bamboo famine,” the statement said.